Serbian tennis star Ana Ivanovic was a former number one ranked player and after briefly falling from the heights of glory, Ivanovic is back on the competition trail to reclaim her spot at the top. Born in Belgrade in 1987, Ivanovic took to tennis from a young age and began training and competing in various tournaments. Known as an agressive and powerful player, Ivanovic first reached the finals of the junior Wimbledon tournament in 2004. That year marked the start of her international career. Ivanovic quickly climbed the tennis rankings and on August 18, 2008, Ivanovic claimed the number one spot on the world tennis ladder. Since then, Ivanovic has fallen from her earlier heights, but this year she's ready for a comeback. Here's your chance to have your questions answered by one of the sporting world's most well-known tennis players. Please leave your questions below or you can also visit our Facebook page at www.facebook.com/CNNconnect and become a fan. Do you feel more comfortable now that you have a female strength and conditioning coach and what is the plus on haveing one? Congratulations on a great finish to the season and best of luck in 2011! Any specific recommendations for a fitness regime for an amatuer who wants to get better? What specific strength training excercises would you recommend focusing on? Ana,congratulation on winning Linz and Bali,great way to finish the season.My question is next :which dress do you like the most to wear on the court?Veliki pozdrav iz Beograda. Have you ever been approached for a movie role? Or has such a thought ever crossed your mind? Since Monika Seles introduced a serbian tennis to the world, there have been a lot of good players coming out of Serbia. When you expect would your country produce a real world champion? Ana, congratulations on your victories. Whose idea was to start the collaboration with Marija Lojanica as your own personal fitness coach? In your career you have worked with several caoches, who do you think has contributed most to the developement of your game as we know it today? Hi Ana. You recently parted ways with your coach Heinz Gunthardt and are now in the process looking for a new one. What is the most important quality in a coach and how much does coaching play a role in your success? 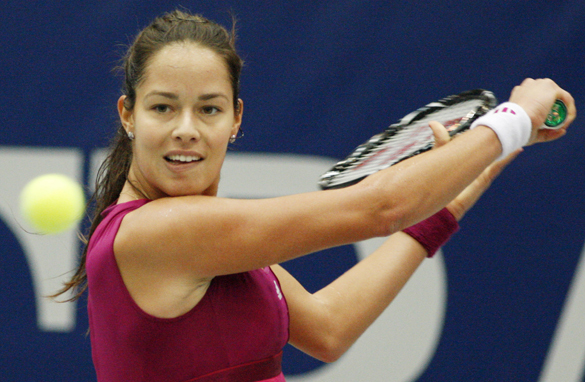 Ana, we are both fans of yours and wonder if you expect to regain your number 1 spot in 2011, and which player is the biggest obstacle to that? Also, are you looking to change your playing strategy or technique in any way, or is it mostly a mental challenge now? A lot of fans give you gifts, send you messages and so on. Do you like that kind of a support? What gift or deed do you remember the most? What is your biggest dream off the court? Thank you! Have you ever tried skydiving and do you like it? who will be your next coach and have you started practicing for the next season? What do you think about players retiring and then unretiring ?? Do you see yourself doing that ? What was the best tennis match you ever watched WTA/ATP ?? Who is winning Davis Cup this year ?? I just want to wish you the best of luck in your triumphs. Also hope you help others as you climb to the top, and when you get there you stay as the person you truly are. –	How will you Improve Stopping Knee and Wrist Tennis Injuries? I am awaiting Ana Ivanovic’s replies. Are the new T-Mobile spokes woman?? Hope soon you can climbe to the number one rank again! Self-confidence and aggresive attack are your virtues, keep them go! You are a passionate tennis player who was the number one very short and as a fan due to your age and succes, i am glad with your come back. Is it harder to work your seccond way up to the top or the first time to become the number one in 2008 and what caused the drop in 2008. A lack for a new goal or because you reached the top? Hi Ana! I just wanted to know What's your favourite/s TV show/s at the moment? what are you into these days? Greetings. As a professional you probably will not admit another player may get the best of you on the court, but are their a couple WTA opponents that just play a style you have difficulty with? Not necessarily higher ranked. Thanks. I read somewhere that you got first racket as a gift for your fifth birthday. Do you still keep it? And do you keep your childhood trophies? Who do you most appreciate of the former male tennis players? Would you consider joining the United States Professional Tennis Association when you retire? It is the oldest and largest tennis teaching association , from 1927. Many great champions have done so, and it would be very helpful for a younger generation champion to renew the popularity of tennis for health. My question is, what changed? How did you turn things around? First of all, congratulations! Secondly, is there such a thing as "reading" your opponent's body language? Example, if she lifts the front of her foot you know what kind of serve is coming (just an example). If yes, is it reliable and is it possible to spot "fake" moves (wherein the opponent deliberately shows a certain action but does another thing)? Hi my idol, Ivanovic, I do love watching Tennis, and you are one of the two female tennis player whose style of play does take my fancy. I have two questions for you. The first is what job are you going to do after retiring?. The second is how confident are you you can return to the No.1 spot on the world tennis ladder? congrats on your bali and linz win we are so hapy for you... im sure wta is happy with your win my question is what is the best experience you have encountered with a fan and what happenend?? ;)) best wishes to you ana we love you! Can you tell me some words or mind thoughts to help me focus all the way thru my games better? I am 12 and when I play against another girl that is really good I loose my winning focus. Ana, let's talk about style. At your last Wimbledon, you wore a magnificent earth-color ensemble with a dash of pink in the quarterfinals, and in the 2008 Australian open you favored a heavenly range of pristine whites and pastel blues in your on-court attire. How do you mix fabulous and functional? And can you dish on who you think is the the most fabulous – and the most UNfabulous in the pro tennis circuit? i'd like u tobe no 1 again, what r ur preparations ? (How) have you managed to keep a healthly balance between tennis and the WTA tour, and your personal life? Has becoming a top tennis player been a barrier to having a relatively normal and satisfying personal life and relationships? Which holiday destination would you chose to travel in a free time – Cuba, Key Biscayne, Hawaii, Sicily, Montenegro or Santorini (or some other Greek island)? Hi Ana! What is your favorite movie, book, sports club and music for relaxation? Hey Ana! Congratulations on your great end of the season. Since it's off-season and u like fashion, I wanted to ask what you have bought recently and you are the most happy about? There is big question who will dominate women's tour in near future after upcoming end of Williams sisters and two Belgians era. You and another 1987-born WTA star Maria Sharapova still seems like best bets, despite all problems in previous two seasons. My question to You is from which group of WTA players You personally expect more troubles and bigger threat in, lets say, next 5 years: from upcoming youngsters (Wozniacki, Azarenka, Radwanska...), or from opponents born in the middle of 80's (Kuznetsova, Safina, Jankovic, Zvonareva...)? I'm from Singapore and I'm a huge fan of yours. I understand that you are in the process of looking for a new coach and I've read from articles that this time you are going to very patient in selecting one. But it is the off season time now. How would you prepare yourself now and the coming few weeks for the 2011 season without a coach by your side? Or in other words how hard is it to coach yourself during these times of change or transition? Thank you and good luck for the 2011 season! Hope you win the Australian open!! mabuhay from the philippines! even though you consider yourself as a big monica seles fan, your game has often been compared to that of steffi graf's. it's probably because both of you have the best forehands in tennis and you've both been coach by heinz gunthardt. how do you feel about this comparison? have you had the chance to meet her before? hopefully you could play together in an exhibition game. Hi, Ana I'm a really really huge fan of yours, I never doubted about your comeback at the top. But, I want to know,what's the matter with Jankovic ? We (fans) can see that there is a problem. I mean she said you hit the ball as hard as a man (stupid). Then, she claimed that she would never pose almost naked like you did becaose of her parents (you only pose in bikini and you always had something to cover you body). Again, she and her mother disrespected you about your "lack of commitment" about the Fed Cup (completly wrong you knew you wouldn't be able to defend your country the right way = proof of commitment). And finally (thank god), she made "your fistpump" afer she won against you (no class at all). So, what 's the history between you two. Ana,congratulations for the titles in Linz n Bali this year.. I'm sure that you will be number 1 again.. I was wondering what your dream vacation spot would be? Thanks!